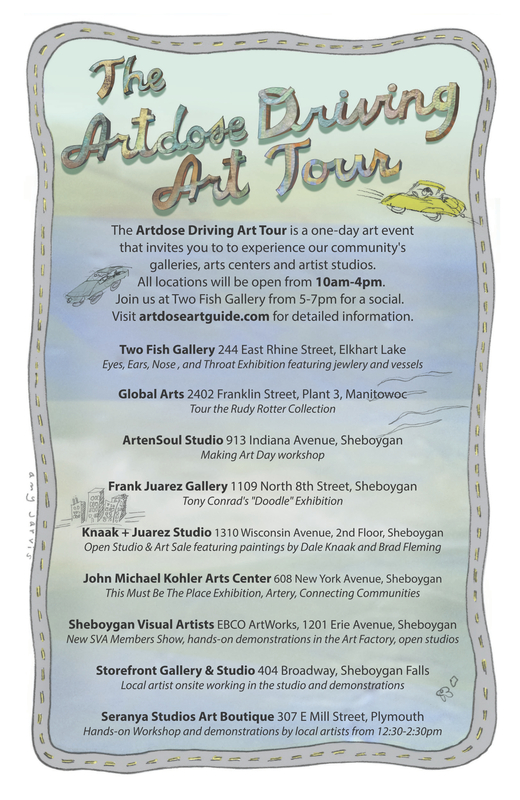 Artdose Art Guide is happy to announce the 2014 Artdose Driving Art Tour. What is a driving art tour you may be wondering. Well, it is a one-day art event where the public can experience the local arts in North East Wisconsin. Art galleries, arts center, and artist studios will be open from 10am-4pm with a social gathering at Two Fish Gallery from 5pm-7pm. Two Fish Gallery is located at 244 East Rhine Street in Elkhart Lake. All questions can be directed to Frank Juarez at frankjuarezgallery(at)gmail.com. The Artdose Driving Art Tour ad was designed by Amy Jarvis. This entry was posted in Uncategorized and tagged art scene, art tour, artensoul studio, frank juarez gallery, global arts, john michael kohler arts center, knaak+juarez studio, north east wisconsin, seranya studios art boutique, sheboygan visual artists, storefront studio & gallery, two fish gallery on September 16, 2014 by Frank Juarez.